I certainly have no argument against his contention that “the modern world…was born in and determined by violence.” Military historians often try valiantly to make this point to other historians who think we don’t do anything more than give narrative accounts of battles and biographies of generals. But it’s also important to understand the dynamics of that violence, or how it played out at the local level. Because Cutterham sees the war as “a story of dissolving sovereignty and contested authority, lawless violence and the search for security.” He adds “Its true theorist was not John Locke, but Thomas Hobbes.” The latter statement is certainly true, but it’s also true for pretty much all war. The American Revolution was not unique among wars in its violence. However, I would suggest he overstates the case by writing off the war as complete anarchy. If you look at the way the violence unfolded, you begin to see a logic to that violence. First, Minty is right that we need to decide what we mean when we ask if the American Revolution was a civil war. Do we mean because all sides were “British?” If so, I think Minty is correct to ask to what extent the North American colonists still saw themselves as British. Certainly there were extensive economic connections, but those alone do not mean they all saw themselves as British. A number of historians have suggested that by the time of the American Revolution many of the North American colonists had started to see themselves as something different from those in the metropole, including on political, social, and religious matters. More importantly, perhaps, I’m not sure calling the Revolution a civil war because most of the players were of British origin really tells us much. More interesting, to my mind, is determining whether the course of the war between colonists makes it a civil war. Minty is right that it is difficult to do so because of the sheer fluidity of the situation, but I’m not sure this is the most satisfying explanation for why the Revolution was not a civil war. Certainly the American Revolution was not the only war in which those involved (and even non-combatants) changed their allegiances with the changing circumstances. Revisiting some of Holton’s starting assumptions, however, starts to muddy the “anarchy” interpretation of the war. His suggestion that the Patriot leadership (or in this case specifically the Virginia gentry) is seen as having gone into the war proudly, confidently, and/or optimistically with no hint of self-interest is something of a straw-man. Or at least, it doesn’t really exist in any of the historiography going back decades. In fact, the very first words in his introduction are “Americans tend to think,” in that the general public – not historians – sees the Founding Fathers this way. Most historians and even many Americans recognize that the Patriot leadership had their own motivations. The rest of Holton’s book concedes that the ideological and self-interest motives cannot be so easily separated. Whether it was western land, tobacco prices, or their debts to merchants, the Virginia gentry believed time and again that Parliament was privileging other groups over them, and stripping them of their right to have representation on these issues through their assemblies. Holton is by no means the only historian who makes this argument of a Patriot elite unprepared for war and struggling – usually unsuccessfully – to restore some kind of order and their own political authority. Coming back now from that mini-book review tangent, if you accept that self-interested motives did not necessarily mean that the Patriots were not also acting on ideological motivations, it’s possible that the elite were not caught unaware by the fall of the royal provincial governments after all, and that they had established their political and military authority over internal enemies even before the beginning of 1776. Indeed, the organizations they set up – from early organizations like the General Committee in South Carolina to provincial congresses, provincial councils of saftey, and local committees of safety – were intended for the very purpose of competing with the royal provincial governments for political authority and control of the population. The Patriot elite were not surprised by the fall of those governments; they helped cause the fall of those governments. If we consider that the Patriot leadership helped bring about the collapse of royal governance, then you can begin to see a logic to the violence – and that the violence was actually rather limited when it did not serve the strategic purpose intended for it by the Patriots. As I mentioned in my earlier post, the Patriot leadership sought to control Loyalists, slaves and Indians as a way to both deny the flailing royal provincial governments the support of those groups and to deny the British their support in subsequent attempts to retake the southern provinces. They did this through the use of violence, but they also generally maintained limits on that violence, and achieved their objectives through other means like propaganda and intimidation. They also had the temporary institutions in place that bridged the gap between overthrow of British rule and organization of state constitutions and governments. The first months of 1776 were not characterized by anarchy that forced the elites to declare independence and form state governments. The leadership had already established a sufficient degree of control by that point, particularly following the campaign of summer and autumn 1775, led by William Henry Drayton, to drive out loyalism in the South Carolina backcountry, and the subsequent collapse of North Carolina loyalism at Moore’s Creek Bridge in March 1776. Moreover, this control lasted even through the fall of Savannah and Charleston to the British in 1778-1780. When the Patriots engaged the British Army in regular battle, they usually lost soundly. However, when they prevented the British from accessing loyalist support in the Georgia backcountry and parts of South Carolina in 1779, and finally all of South Carolina and North Carolina after 1780, they frustrated British plans to achieve quick pacification and remain on the offensive. They were also helped along by British inability to understand why Loyalist support was not what they expected. The British blamed this lack of support on false promises of support from Loyalist leaders, and on the stupidity, weakness, and treachery of individual Loyalists. But they never fully understood the enemy’s strategy. Patriot leadership turned over rapidly, particularly following the fall of Charleston when much of the original (low country) South Carolina leadership from 1775 were taken prisoner and sent to Saint Augustine to keep them from communicating with their compatriots or organizing further resistance. Responsibility for leading the Patriot forces now fell to mostly backcountry leaders like Thomas Sumter, Francis Marion, and William Lee Davidson of North Carolina. But they continued the same strategy that had served the Patriots since the beginning of the war – avoid conventional battle, isolate the population from the British and prevent the latter from leveraging the loyalist support that was critical to the success of their southern strategy. Davidson summarized that strategy in September 1780 when he told the North Carolina governor, Abner Nash, that “a General Action at this time would be dangerous but there is a grate opening to effect something in the partisan Stile.” Davidson explained that his men were doing this by breaking up parties of Loyalists as they formed along the North Carolina-South Carolina border and preventing them from reaching Cornwallis’s army in Charlotte. Was the American Revolution (in the South) a Civil War? If we then accept that the Revolution in the South was not just one large paroxysm of senseless violence, but that there was a logic to the use of violence we start to get closer to determining whether it was a civil war. But first we have to ask what analytical purpose we hope to serve by answering this question. If we use the most literal definition of a civil war, that it was fighting between two groups from the same polity, then yes, it was a civil war. But perhaps historians could benefit here from political scientists who focus on civil war. James Fearon, for example, defines a civil war as “a violent conflict within a country fought by organized groups that aim to take power at the center or in a region, or to change government policies.” The Loyalists, however, were not fighting to take power themselves, but to maintain British imperial rule from the periphery in London. The rebels, meanwhile, were not fighting Loyalists to prevent them from taking power, but instead to prevent them from supporting the British strategy to reestablish that same imperial rule. The two primary actors in this conflict were the rebels and the British government, both of whom competed for control of the population. The greatest threat to the rebels’ political authority was the British government and army, not the Loyalists as the literature would suggest. Their objective was to control the Loyalist population, not to destroy it. Formulating and implementing a policy to arrest or destroy every Loyalist would have necessitated significant logistical requirements that would have been detracted attention and resources from the more important threat. It was more than sufficient for the rebels to meet their objectives by instead controlling the Loyalists and preventing them from aiding the British army. This interpretation of the war in the South suggests that the Loyalists were a means to an end for both the British and the Patriots. It suggests rebel violence was both more common and less virtuous than the consensus school would allow, but also more targeted and strategic, and less single-minded and villainous than many recent historians contend. This points to the need for new interpretations of the American Revolution that dissociates the southern and northern theaters, and avoids conflating the latter with the war in general. This argument that it would be inaccurate to label the war in the South a civil war – and that it would lead to a number of mistaken conclusions about the dynamics of violence in the conflict – applies only to the South. The British had a distinct strategy for the South that they had not pursued in the North. The British did not articulate the same central role for Loyalists in their political-military strategy in the North, and as a result fighting in the North did not have the same strategic logic that it did in the South. 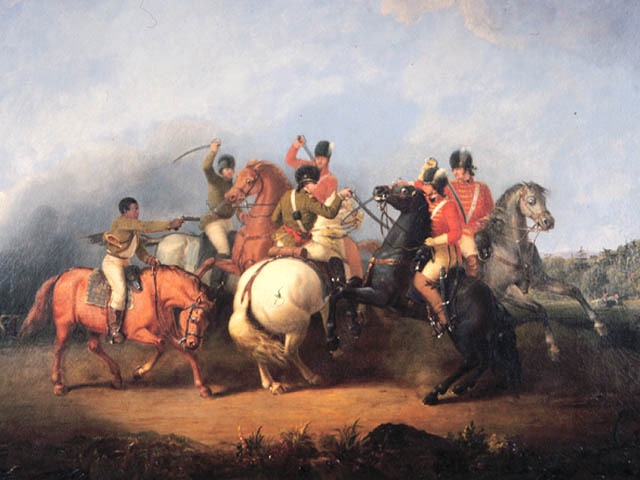 Instead, British attention in the North remained on defeating Washington’s army. There is a clear shift in the writings of British military and government officials in 1778, as the war moved south, regarding the role of Loyalists and the political elements of the conflict that were largely absent from their thinking about the northern theater. Despite bitter conflict between Loyalists and rebels, the Loyalists were much more ancillary to the British strategy in the North than they would be in the South. Circumstances therefore allowed the southern rebels to implement a strategy of population control that would best counter the British strategy in the region. Both sides understood the central role Loyalists would have in British strategy in the South, and control of that group was the central focus for the rebels’ shadow governments. This supports Minty’s argument that the war in New York was not the war in South Carolina. Minty argues the conflict was more a civil war in the South but in the North but I would be inclined to argue the opposite – ironically based on Minty’s writing about the way Loyalist and Patriot lines were drawn in New York. He argues that in New York, “loyalism did not have its origins in…opposition to the Continental Congress. On the contrary,” Loyalist political groups “made clear their explicit opposition to the Intolerable Acts throughout 1774. Instead, their loyalism was grounded in partisanship, in pre-existing internal political conflict. The question of ‘who should rule at home?’ was utmost in their thoughts.” In that sense then, unlike in the South the Patriot-Loyalist conflict was indeed over which of those two groups would exercise political authority in New York. I don’t know New York like he does, and I look forward to reading his book when it is published to see if my interpretation is correct. In the end, the question of whether the war was a civil war cannot be answered based on observations of violence. One has to understand the purpose of that violence – and there is a logic or strategic purpose to violence in war. It doesn’t mean it was uniformly adhered to by all parties through the war – that almost never happens – but it is important and necessary to understand that there is an underlying purpose to the use of violence that remained relatively consistent throughout the war, even as the Patriots lost major battles to the British. Woody Holton, Forced Founders: Indians, Debtors, Slaves, and the Making of the American Revolution in Virginia (Chapel Hill: The University of North Carolina Press, 1999), xxi. Holton, Forced Founders, xii. Another question I’d like to debate is whether academic history should be written primarily with the purpose of correcting, say, the Bill O’Reilly school of history. Climate scientists don’t publish their academic work with the primary objective of correcting those who don’t believe in global warming. Nor do geneticists publish academic work primarily with the objective of correcting the Food Babe. This approach, however, is all to common in academic history and statements like this are not only nearly impossible to prove, but setting up an argument to attempt to counter this contention can also lead to erroneous conclusions. But let that bide. William Lee Davidson to Abner Nash, 24 September 1780, William Lee Davidson Papers, Davidson College. James D. Fearon, “Iraq’s Civil War,” Foreign Affairs 86 (March/April 2007): 2-15. This entry was posted in Uncategorized by troyda. Bookmark the permalink.